← God’s Emotions 4 – What are Emotions Anyways? —-An interview with Thom Stark, author of The Human Faces of God. Thom Stark is a scholar of ancient and modern religious texts. He is currently an M.A.R. student at Emmanuel School of Religion in Johnson City, TN. His first book, released in October, is called The Human Faces of God: What Scripture Reveals When It Gets God Wrong (and Why Inerrancy Tries To Hide It). In chapters 4 and 5, Mr. Stark systematically lays out evidence that polytheism and human sacrifice were practiced widely as a part of early Yahweh worship. That’s just the thing. The Bible doesn’t really tell one story. And by that I don’t just mean that the Bible is a collection of different stories. I mean that the Bible consists of a spectrum of competing stories. The Bible is sort of like a choose-your-own-adventure book, except none of the alternative storylines ever gets resolved. They’re all particular stories, about a people called Israel, their god Yahweh, and the relationship of Israel and Yahweh to the rest of the world. They all try to explain why Israel is suffering, why the world is broken, and how through the reversal of Israel’s fortunes the world is going to be mended, but they posit different answers to those questions. I was raised that the Bible was the literally perfect, “inerrant” word of God. What you are saying sure calls into question this point of view. 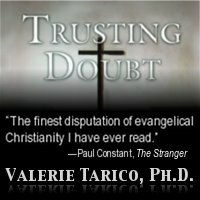 Gallery | This entry was posted in Musings & Rants: Christianity, Uncategorized and tagged biblical criticism, bibliolatry, Christian fundamentalism, The Human Faces of God, Thom Stark. Bookmark the permalink. It seems like Thom Stark wants his cake and to eat it too. I went through the same process while attending Bible college many moons ago, and it took me several more years of unwavering self-examination and honesty before I was able to wholly step outside the circle of parochial faith and embrace the undeniable conclusion. Cognitive dissonance is a powerful determinant and makes for strange bedfellows. I just ordered The Human Faces of God directly from the publisher as I am curious to see just how close Stark is before he enters Chapel Perilous and recognizes what he is currently pretending not to know (at least publicly, he may have a slow-brewing agenda). It will be interesting to see where Thom Stark alights intellectually in the next five years. Myself, I reached a point at which the Christian faith didn’t fit, even at the level of metaphor or as a door to wonder and joy, or as a basis for moral community and social engagement. But I have friends for whom it does fit at one or more of those levels, and some of them choose to remain as reformers within the Christian tradition rather than moving outside.